For decades, Eastern North Carolina was dense with small tobacco farms that provided a healthy income and built deeply rooted agricultural communities. Today, the farmers, young and old, are in a race with time. “Where there were 45 small farms, there are now four,” says Natalie Relyea, a 51-year-old farmer from Walstonburg, North Carolina, who with her husband, John, grew mainly tobacco on their 200-acre farm. The crop once provided 88 percent of the family’s income, but in recent years they’ve had to diversify. For decades, tobacco farmers were guaranteed a price and market for their crops through a quota system established during the New Deal. That was all axed in 1997 with the Tobacco Master Settlement Agreement. In its wake grew the federal tobacco buyout, in which farmers received either a lump sum or an annuity, canceling out the quota system. (As of 2012, the program had paid $4.11 billion directly to tobacco growers and $5.85 billion directly to former quota owners.) But the buyout ended this spring, and how North Carolina farmers will transition from their tobacco years remains to be seen. Goats raised in a former industrial chicken house. Some are growing sweet potatoes, others are re-purposing greenhouses for hydroponics or starting up strawberry crops. The Relyeas chose to plant more butter beans. They also launched Relyea’s Crazy Claws Prawn Company in 2004 with an $8,000 grant from the Rural Advancement Foundation International (RAFI) designed to help transitioning farmers. Last year, a second grant allowed the couple to acquire a butter bean sheller, allowing them to contract with neighboring farmers to grow the beans for sale at their roadside farm stand. Both ventures have helped the Relyeas recoup some of their losses, even if it will never amount to the income made during their tobacco years. Since 1997, RAFI’s Tobacco Communities Reinvestment Fund (TCRF) has provided an estimated 500 farmers with small grants to help them replace lost tobacco income by backing their new ideas. Recently, RAFI expanded the program to include all farmers, from Hmong flower farmers interested in building greenhouses to collectives putting together tool lending libraries (see the audio slideshow below). Now these farmers’ experiences in transitioning and diversification will make up an online library designed to help farmers nationwide. Funded by a $15,000 Kickstarter campaign, which successfully met its goal over the weekend, work can now begin on the Growing Innovation resource library. The goal is to include interactive maps, photos, records of personal experiences, farmers’ budgets, and detailed plans of their farm-led projects. RAFI has teamed with FarmHack to help build the site. A portion of the money raised will be used to publish a coffee table photo book of farmers helped by the grants. To date, the reinvestment fund has helped create everything from mobile farmers markets to a mozzarella cheesecake production to wind-powered farms, says Joe Schroeder, RAFI’s Farm Sustainability program director. Open-sourced, the library will be searchable by topic or category and will provide the opportunity for farmers to continually add information and resources. A flower farmer in his new greenhouse. Online research libraries such as Growing Innovation come at an important time in agriculture, Schroeder adds. 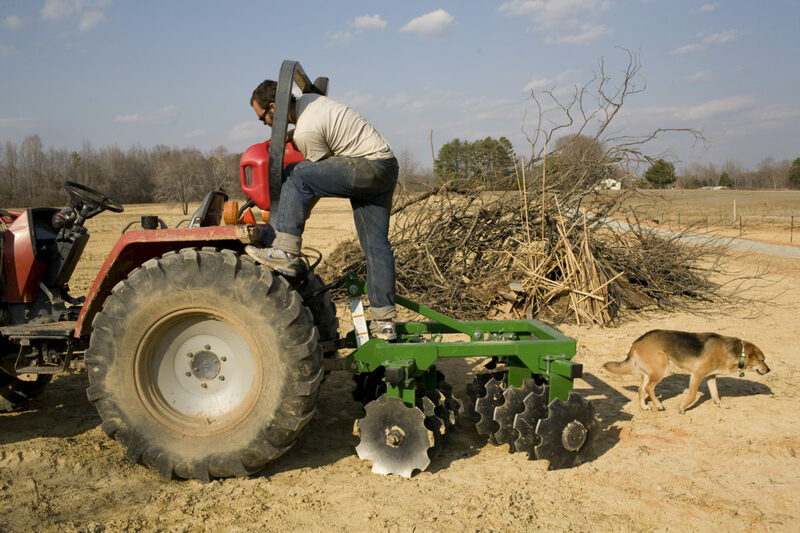 More people are expected to be experimenting with small scale farming and the internet is becoming an additional tool in the farmer’s arsenal–as important today as draft horse and combines once were. The Relyeas’ journey, for example, could help farmers interested in raising prawns. Randy Lewis, a dairy farmer since 1980, is another good example; he runs the Ran-Lew Dairy in Snow Camp, North Carolina. After facing severe financial hardship and losing the family’s life savings, Lewis decided to transition his traditional dairy into a micro bottling plant and eventually began to manufacture yogurt. The Lewises used their RAFI grant to purchase a trailer for their refrigerated milk tank, fitting it with both electricity and plumbing. Like tobacco, the changes in the dairy industry have left many producers in the lurch. Losses like these are “a drain on the rural economy and there’s no silver bullet,” Schroeder says. Photo Credit: Alix Blair for RAFI, 2011.